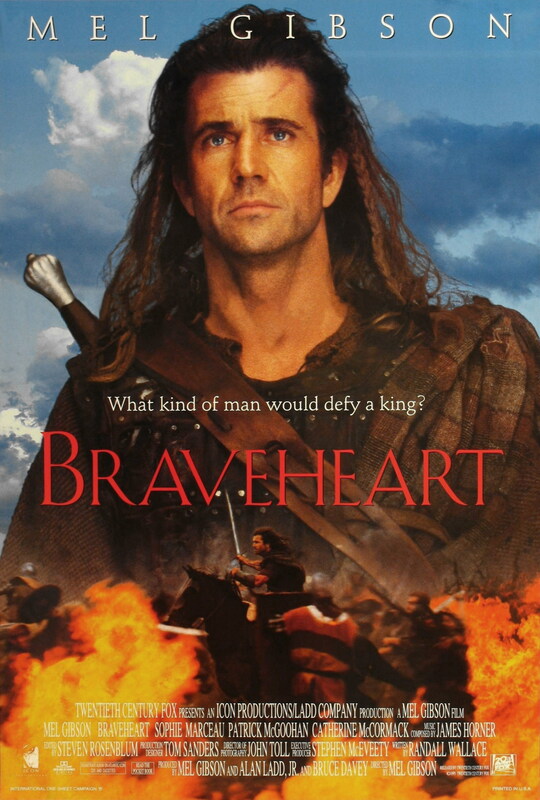 Braveheart – Did You See That One? After a series of personal tragedies at the hands of the English, William Wallace (Gibson) leads a revolt against King Edward I (McGoohan). This film was a very personal project for Mel Gibson (Payback), who fought hard to get the necessary financing. His gamble paid off when the film won five Academy Awards including Best Picture and Best Director. The screenplay was penned by Randall Wallace (We Were Soldiers), earning him an Oscar nomination for Best Original Screenplay. Mel Gibson not only directed this movie, but he also starred in it. He’s joined by Patrick McGoohan (Escape from Alcatraz), Sophie Marceau (The World Is Not Enough), Angus Macfadyen (Equilibrium), and Catherine McCormack (Spy Game). The challenge in bringing a true story from medieval history to the big screen is knowing where to mix fact and fiction. Some critics have slammed this movie for the historical inaccuracies within, but I’m not sure how important that is. The history is the era is filled with questions and inaccuracies, and any liberties taken in the film don’t change the quality of the story. This is true of most Hollywood historical epics. So, getting past all of the historical inaccuracy arguments… This movie has a really great emotionally driven story. The writing sets up all of the injustice needed to keep the violence feeling justified and somewhat righteous. William Wallace is a great character to tell a story around. The writing uses him to embody the bigger injustices done to the Scottish people by the English monarchy. This story pushes a lot at the audience in a film that runs just under three hours. If there’s any weakness, it might be that the film is highly intense. The payoffs are great, but this story requires patience at times as the many aspects come together. Despite some of the flaws, this is a pretty great story. The acting in this movie does a nice job with the story. I’m not going to judge the accents in the film since I don’t have the slightest idea if they’re accurate or not. Mel Gibson leads the way with one of the best, if not the best performance of his career. He captures all of the emotion of the role without overdoing it. He’s joined by a number of great actors who help to bring the epic scale of this film to life. Patrick McGoohan is one of my favorite performers in this one. His portrayal of King Edward I is the perfect counterweight to the performance by Gibson. Sophie Marceau, Angus Macfadyen, and Catherine McCormack all do great work in this film as well. With such a large cast, it’s nice to see so much chemistry and such unique performances from so many people. The film also featured more than 1,500 extras hired from the Irish Army Reserve. These young soldiers helped to bring the elaborate battle sequences to life. There are a number of other great performances in this one. Just know that the acting won’t disappoint. This movie looks pretty great. This film earned Oscars for Best Makeup and Best Cinematography. It was also nominated for Best Costume Design and Best Film Editing. Cinematography is the standout performer in terms of the visuals. Cinematographer John Toll (The Thin Red Line) does great work on this movie. The epic nature of the visuals gives this the same kind of feel found in movies like Spartacus. The camera work finds all the right moments to get up close, and also seems to know when to step back and let the bigger picture shine. The editing also stands out thanks to the nicely put together battle sequences. These moments feel like they pull from films like Falstaff – Chimes at Midnight, with a sense of reality that makes things almost too intense at times. The film was also recognized for some great audio work. The film won an Oscar for Best Sound Effects, and was nominated for Best Original Score and Best Sound. James Horner (A Beautiful Mind) dug into the culture of the story and composed a wonderful score. The emotional color of the score really adds something to the movie. The music seems to heighten the emotions of certain moments perfectly. Overall, this one has great production work from both audio and visual points of view. Despite the epic nature of this story, the film isn’t as clean as most Hollywood epics. Without spoiling the story, it might best be said that nothing in the movie comes easily. This is a surprisingly refreshing twist for the film and the genre. The intense violence in the film might not be for everyone, but it’s not just a movie about war. The emotional content built into the story shines as brightly as the action. The story does have some slower moments, but it’s all redeemed with nice payoffs and beautiful visuals. In total the film earned 10 Oscar nominations, winning five awards. If you’re a fan of films like Gladiator or other more recent epics, this is one to check out. I would also suggest this to fans of the stars. I give this one 4.6 out of 5 stars. Pingback: Escape from Alcatraz | Did You See That One? Pingback: Mad Max: Fury Road | Did You See That One?